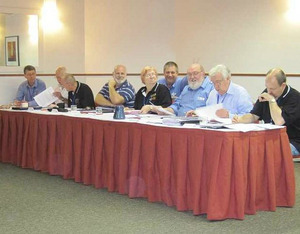 Following the Annual Conference the WIA Board met in Darwin on Monday 30 May 2011. The Board reappointed Michael Owen VK3KI as President and Phil Wait VK2ASD as Vice President. An important task of the Board at its meeting following the Annual General Meeting is to appoint or reappoint the various Contest Managers, Coordinators and other officers. John Spooner VK4AJS wished to retire as Manager of the Jack Files Contest, and Michael Charteris VK4QS was appointed as his successor. The other Coordinators and Managers were all reappointed. The Board has been concerned for some time about communication to members, and appointed a Communication Strategy Group to be led by Chris Platt VK5CP. WIA contests were discussed, and it was decided that a complete review would be desirable, leading to appropriate rules applicable to all WIA contests, as well as the creation of a Contest Committee comprised at least of all the Contest Managers. This project is being led by Bob Bristow VK6POP. Following the Board meeting, the President, the Treasurer and the WIA Manager met with Darwin Amateur Radio Club President Spud Murphy VK8ZWM and Secretary Peter Blackadder VK8HPB to review and finalise the weekend.